Job titles like "Technical Architect" and "Chief Architect" nowadays abound in software industry, yet many people suspect that "architecture" is one of the most overused and least understood terms in professional software development. Gorton's book tries to resolve this dilemma. It concisely describes the essential elements of knowledge and key skills required to be a software architect. The explanations encompass the essentials of architecture thinking, practices, and supporting technologies. They range from a general understanding of structure and quality attributes through technical issues like middleware components and service-oriented architectures to recent technologies like model-driven architecture, software product lines, aspect-oriented design, and the Semantic Web, which will presumably influence future software systems. This second edition contains new material covering enterprise architecture, agile development, enterprise service bus technologies, RESTful Web services, and a case study on how to use the MeDICi integration framework. All approaches are illustrated by an ongoing real-world example. 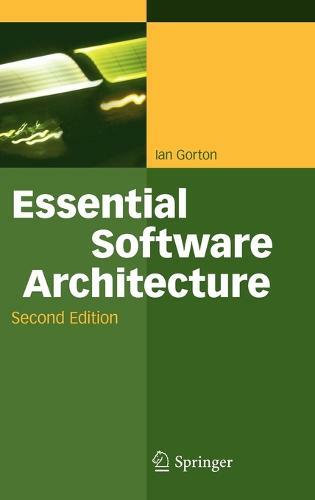 So if you work as an architect or senior designer (or want to someday), or if you are a student in software engineering, here is a valuable and yet approachable knowledge source for you.